Weighing in at 4 1/2 pounds or less, the Himalayan rabbit is one of the more common domesticated rabbit breeds. They are quite inquisitive and enjoy playing rabbit games, keeping owners entertained. The Himalayan requires human interaction and typical rabbit toys to fill their need for playing. 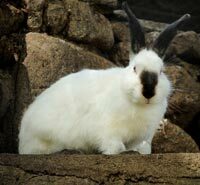 In general, the Himalayan rabbit is extremely gentle, easy to care for and a small size to handle. The body of the Himalayan will be white with the markings on the nose, tail, feet and ears being black, blue, chocolate or lilac. This color pattern is unique in itself as the color tones tend to change with the weather. Hot weather can cause the colors to fade with the white portion of the coat getting a yellow tint. Cool weather will intensify the marking colors. This unique coloring system of the Himalayan is due to the extremities having a cooler temperature than the rest of the body. The color markings are referred to as “pointings” and are more commonly found in black than the other colors. The fur has a silky texture with a short length, displaying fly back properties. There coat doesn’t require extra care, regular grooming will keep the coat shiny and in beautiful condition.